This is the first game in the Mass Effect series. 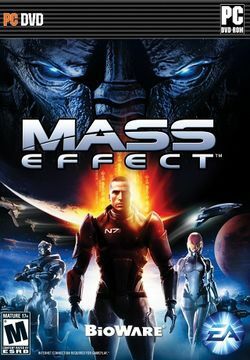 For other games in the series see the Mass Effect category. Mass Effect is a third-person shooter RPG developed by BioWare, creators of Baldur's Gate and Star Wars: Knights of the Old Republic. It was released for the Xbox 360 in November 2007, Windows in 2008, and the PlayStation 3 in 2012. It was followed by a sequel, Mass Effect 2, in 2010. Taking on the role of Commander Shepard, you lead an elite squad on a heroic, action-packed adventure throughout the galaxy. In the not-too-distant future mankind discovers alien technology on Mars that allows them to begin exploring the galaxy by finding and activating "mass effect relays" that have been lying dormant, left behind by an ancient alien civilisation that disappeared 50,000 years ago. Humans are able to join in with the galaxy's other species and begin to spread across worlds. Not everyone is pleased with these events, however. Some species resent how quickly the humans have established a strong presence, and a traitorous elite Spectre agent named Saren has turned rogue and is pursuing his own agenda. Mass Effect allows for open-ended gameplay amidst a deep, immersive story and is presented in a cinematic style. The story revolves around an ancient alien prophecy stating that every 50,000 years a portal opens that separates the "normal" universe and a realm beyond, releasing an ancient artificial intelligence that will harvest all organic life, and the time of their return is approaching. As the first human Spectre—sworn defenders of galactic peace—Shepard's mission is to halt the advancing armies of Saren, a legendary Spectre agent gone rogue. Saren has mysteriously taken control of the Geth, a race of rudimentary A.I. networks, whom he intends to use to shape the galaxy in his image, and to exact revenge against humanity for their perceived injustices against his people. This page was last edited on 16 August 2016, at 17:32.